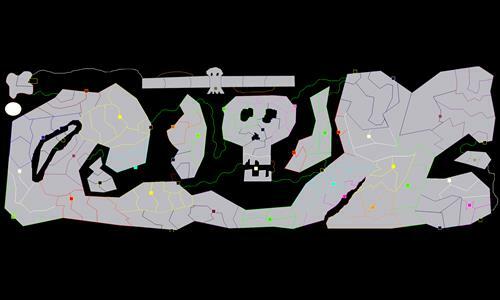 Skull Island is my second map, its a small map meant for 3v3 with manual picks and 3-4 spots. Up above is the power meter. It holds a spot for each team to place one territory there. The key is not to lose the power bar bonus. Thus making this the ultimate team map. If you lose the power bar, a player will gain access to easy 40 income territory. This makes the map very strayegic since you'll think twice on your priorty strikes vs transfers. The point of the map is also not to get eliminted below. If you get eliminted below, you should surrender because you wont escape the power bar with ay troops worth while and stacking will be useless with the bonus available by gaining a majority of the map. If you wish to play without the power bar bonus, i will create a depolyment option for that. Very interesting. I've been musing about ways to design a map that requires players to protect their home bases at all costs. I'm not convinced this does that, however, especially without a custom scenario set up to allocate territories on the power bar. Nevertheless, I rate this map highly for its good playability. I would be interested in a power bar where each territory on it was worth 40 (or whatever) armies, so that every turn required a decision between defending your power bar territory (and thus the huge bonus) and expanding on the mainland. I can maybe do that, making each power bar square worth 0 that way you can customize a game and change those bonuses as such for a custom game. If more ppl comment for this option I will do that. I did create a deployment option where the PowerBar isn't a factor. The main goal was to work as a team and transfer to troops to the end guy so he wouldn't get killed and give up the power bonus all the while trying to expand below. Best played 3v3 full distribution manual picks, IMO.